REBECCA LOVELL: In an effort to foster our self-reliance in the studio, we produced VENOM & FAITH ourselves (and played pretty much all the instruments ourselves as well). Having made music together as sisters for well over a decade, we're deeply musically connected and able to move fast and lean together. As with our previous album PEACH, VENOM & FAITH is all "us" and we really hope that people can hear our souls ringing through. MEGAN: Yes, we're always in search of new ways to present our music - but that search is also a completely organic process. Over countless hours of tweaking and experimenting, Rebecca fleshed out all the tracks that folks will hear on VENOM & FAITH. Using GarageBand and a massive sound library, she pulled together a sound palette that we both found exciting, and then together we built the album on top of that sonic foundation. Change requires exploration! 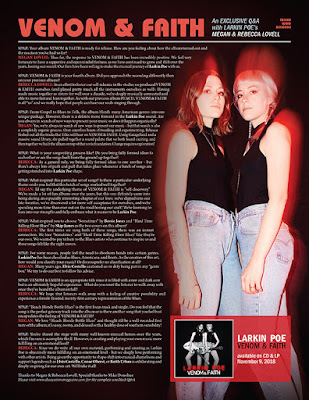 REBECCA: As a general rule, we bring fully formed ideas to one another - but there's always lots of push and pull that takes place whenever a batch of songs are getting stretched into Larkin Poe shape. MEGAN: I'd say the underlying theme of VENOM & FAITH is "self-discovery." We've made a lot of fun albums over the years, but this one definitely came into being during an especially interesting chapter of our lives: we've dipped into our late-twenties, we've discovered a lot more self-acceptance for ourselves, and we're spending more time than ever out on the road honing our craft! 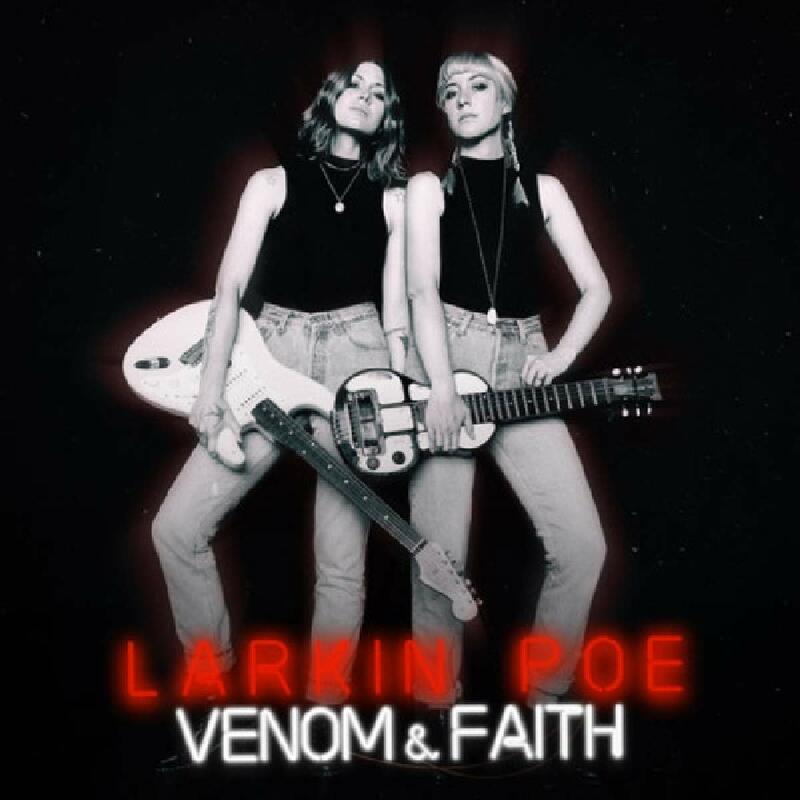 We're learning to lean into our strengths and fully embrace what it means to be Larkin Poe. REBECCA: The first times we sung both of these songs, there was an instant connection. We love "Sometimes" and "Hard Time Killing Floor Blues" like they're our own. We wanted to pay tribute to the Blues artists who continue to inspire us and these songs felt like the right moves. MEGAN: Many years ago, Elvis Costello cautioned us to defy being put in any "genre box." We try to do our best to follow his advice. MEGAN: We love "Bleach Blonde Bottle Blues" and thought it'd be a well-rounded first taste of the album; it's sassy, rootsy, and doused with a healthy dose of southern sensibility! 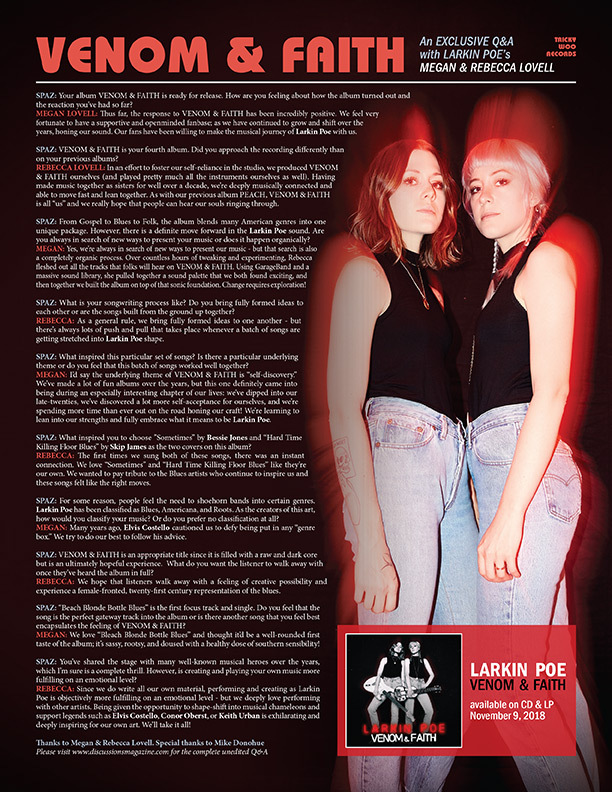 REBECCA: Since we do write all our own material, performing and creating as Larkin Poe is objectively more fulfilling on an emotional level - but we deeply love performing with other artists. Being given the opportunity to shape-shift into musical chameleons and support legends such as Elvis Costello, Conor Oberst, or Keith Urban is exhilarating and deeply inspiring for our own art. We'll take it all! MEGAN: Between now and the end of the year, we're going to be doing a lot of touring in support of the new album; we're always posting new shows on our website - in addition to lots of headline shows, we're honored to be supporting Bob Seger on his US tour this winter. We hope folks will come out and see us! REBECCA: LED ZEPPELIN IV and Iron & Wine's OUR ENDLESS NUMBERED DAYS.